The Cordillera Huayhuash is located in the north of the Peruvian Andes, approximately 360km from Lima, Peru's capital. When flying from your home country you will first arrive at the main international airport in the city of Lima. To get to the Cordillera Huayhuash from Lima, most tourists go first to Huaraz, but of course there are other routes too. Read getting there. Most cities and towns in the vicinity of the Cordillera Huayhuash offer lodging, restaurants, cafes, restaurants and other services. The most popular city near the Huayhuash from a traveler’s point of view is Huaraz. Huaraz is an excellent strategic point from which to prepare for treks and climbs in the region. See the list of these services. The most common activities in the Cordillera Huayhuash are trekking and climbing, the first being more popular. Recently, due to the construction of new unpaved roads, the access is much improved and you can now visit parts of the Cordillera Huayhuash even if you have only four days to spend. See the tour options. In 2002 the Peruvian government declared the Cordillera Huayhuash a national reserve. The region is administered by seven communities, each charging an entry fee for their respective area (this serves as a camping fee in most). The entrance fee for 2013 to visit all of the Cordillera Huayhuash is S/ 190.00 (USD 76.00) Approx. See the list of the communities and what they charge. If you would like to go trekking and/or climb in the Cordillera Huayhuash, it can be organized in you home country or with a local travel agency in Perú. It is best done in Huaraz, because using a local travel agency contributes directly to the local economy of the Huayhuash communities. The rainy season spans from October through March, and the dry season (also known as the “Andean summer”) spans from April through September. During the Andean summer the weather is stable with only one or two mediocre days in a week and sometimes with weeks of perfect weather. 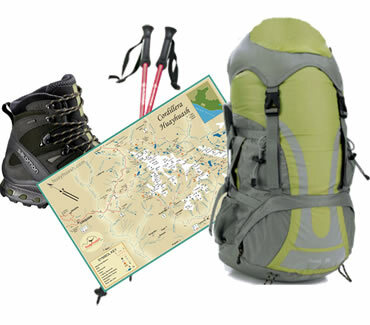 It is during these summer months that the majority of the trekking and climbing takes place. A typical Andean summer day begins with a cloudless blue sky and warms until midday often reaching 20ºC at 4000m/13,123ft. The mornings and late afternoons can be chilly at this altitude with temperatures dropping to 0ºC. Wind is not generally a concern at this time of the year.